Your cardiovascular system is what moves blood through your body, delivering oxygen, nutrients, and more to its many cells. Those veins and arteries keep you alive. In your home, there are pipes that deliver water to different rooms of the house, helping you stay clean and hydrated. In both your body and your home, blockages can cause big problems. 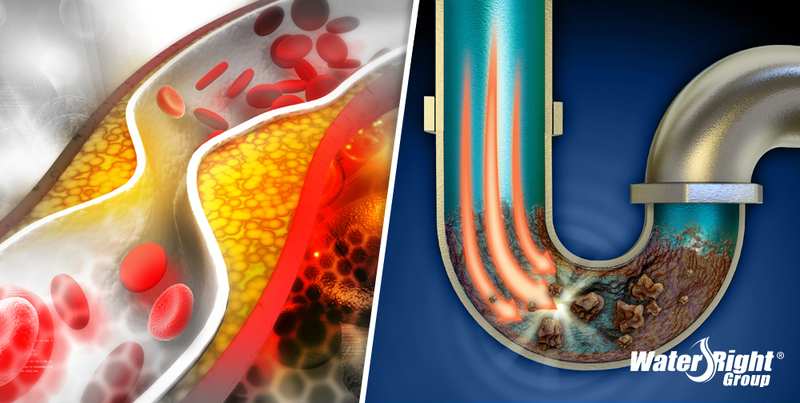 While plumbing issues aren’t nearly as serious as having a heart attack, there are some striking similarities between pipes and heart health. At your annual physical each year, your doctor draws blood to get a screen shot of the current state of your health. One of the many tests you will have run is a cholesterol screening, but the number that is returned is only half of the answer. As you know by now, there is both good and bad cholesterol. High-Density Lipoproteins, or HDL, help build your cells and remove harmful cholesterol from your body. HDL is often referred to as “good” cholesterol, and high numbers are a sign of good health. LDL, or Low-Density Lipoprotein, latch onto the fats in your food and build up on artery walls. This slows the flow of blood to vital organs, weakens artery walls, and is a contributing factor to heart disease. In your home, minerals can build in your plumbing system and wreak havoc on fixtures, slow the flow of water, and weaken your pipe walls. Calcium and Magnesium are considered “good” minerals. In the right application, they build bone strength, and support nerve and muscle function. The minerals in your tap water, however, come from dissolved rock solids. This is much more difficult for your body to absorb and assimilate. Eating a balanced diet high in vitamins and minerals will supply your body with the nutrients you need, and a multivitamin can supplement where your diet leaves off. Consuming the minerals in your water isn’t dangerous, but isn’t particularly beneficial to your health, either. And while the calcium in your water won’t clog your arteries, it can clog your pipes and faucets over time. Hard water is a fast-food burger and fries to your home’s vascular system. Minerals slowly building on the walls of your homes circulatory system like plaque in your arteries. The water pressure builds to try to accommodate, and the pipe walls take a beating and begin to weaken. You now have a ticking time bomb. Is Your Plumbing In Danger? Health problems can be inherited, through no fault of your own, from parents who were genetically predisposed to them. Your very building blocks may be the reason for your high cholesterol, just as certain homes are predisposed to damage from hard water. Copper and PVC pipes may be susceptible to calcium and scale deposits, while steel pipes are the most vulnerable to hard water damage. Hard water isn’t, in itself, dangerous to you. It can, however, be a real pest and become an expensive nuisance. Clothes that wear out too fast, dishes that stay spotty, and appliances and fixtures that never seem to come clean are all the byproduct of over-mineralized water. Heavy, filmy hair and dry, itchy skin are caused by soap residue that binds to minerals and stick to your hair and body. While these obvious issues are a hassle, it’s what you can’t see that could cost you. You shouldn’t always have a supply of drain cleaner in your home. Clogs happen, but if they’re happening frequently, hard water may be wearing out your drains. Pouring fuming chemical solvents down your pipes once a month to combat buildup isn’t just hard on the environment, it can wear your pipes thin. Eventually, chemical solvents will fail to unclog your drain and expensive professionals will need to be called in. Depending on the severity of damage caused by the cycle of over-mineralization and harsh chemical solutions, pipes may need to be replaced or your entire system may need to be upgraded. Hard water isn’t just a drain on your pipes as it leaves your plumbing system, it’s a real drip for your faucets and fixtures as water enters your home. If you have noticed poor water pressure, this could be a sign that minerals are building up. If you see chalky white residue on your showerheads and faucets, you have lime scale building a problem in your plumbing. This could constrict water flow, making your water pressure weak. Your home has many expensive appliances which are necessary to function in today’s world. Your washing machine, dish washer, water heater, and even your coffee pot can all be damaged by hard water. A study by the Water Quality Association indicated that both gas and electric water heaters have their life expectancy cut by approximately 50% in homes suffering from hard water. This is a huge problem when you have to replace an appliance that can cost upwards of $1200, but the efficiency of the appliance is reduced long before it finally fails. This means you will have paid months or years of increased utility bills to work the machine harder and harder as it struggles against the hard water. The symptoms of high cholesterol are subtle, but hard water is much easier to spot and diagnose. Mineral deposits on fixtures and appliances, low water pressure, and scale and soap scum build up are all hallmarks of a hard water problem. While you can note these problems visually, you may decide to have your water tested just to be safe. Our team of experts offer free in-home water analysis and can offer you a full report on your water’s list of “ingredients”. This includes a full diagnostic and even the level of mineralization in your water. If your family shows a history of cardiovascular disease or poor heart health, your doctor will recommend several steps for you to take to lower your risk. You will learn how to stop cholesterol from building up in your system and you can prevent health problems before they start, and lead a longer, healthier life. Similarly, an ounce of prevention is worth a pound of cure for your plumbing. Keeping your pipes clean and strong is easier and more cost effective than removing buildup and replacing the pipes. Higher quality, safer water is the first step in increasing your home plumbing and appliance efficiency. A water softener can be your first line of defense against mineral build up. The effects of a softening system can be seen not only in your plumbing, but on the brightness of your clothes, the softness of your skin, and the cleanliness of your home.